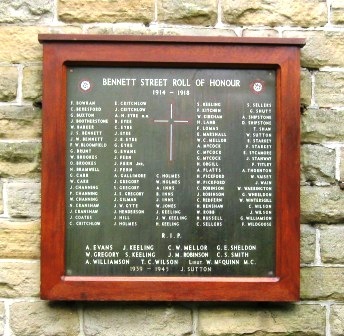 The Bennett Street Roll of Honour commemorates all those who served in the Great War and lived in Bennett Street, Buxton. Some men did not return and their names are printed at the base of the plaque under the initials R.I.P. There is also the name of one resident who fought in the Second World War who was added in the late 1950s or early 1960s when the original shrine was replaced due to disintegration. . The original plaque (below) was a large piece of wood, lettered with those who served and those who died, which was covered in glass. A figure of the crucified Christ was placed in the centre. By the 1950s the shrine was in a poor state of repair and things came to a head in August 1964 when "The Buxton Advertiser" printed a front page article where the residents of Bennett Street expressed the wish that the Memorial be repaired or removed. 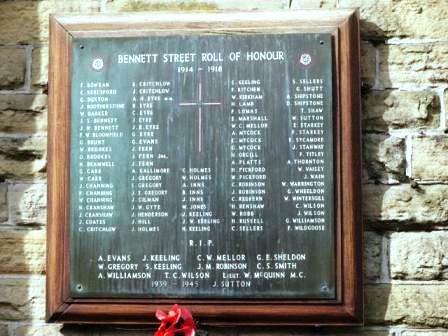 "Buxton Borough Council's refusal to renovate a Great War Memorial on Bennett Street has annoyed some local residents. 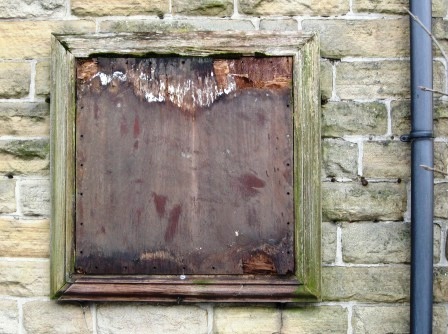 At their last meeting the Borough Council decided they were not prepared to repair the wood and glass memorial hunk on a side of a house at the bottom of the street. The Council thought they certainly had a duty to repair memorials concerning the whole town or large areas of the town, but not concerning individual streets. Most of the street's residents think the memorial should be brought up to standard or completely disposed of because it is in such a bad state of repair. Parts are missing, and above an old and weather stained wreath some of the names are barely legible. The glass front has long since disappeared." The article went to explain that: "The memorial was erected shortly after the Great War from funds obtained by the street for winning a wells dressing prize as the town's best decorated street. Residents thought the finest way to use the money would be to erect a lasting tribute to the men … who gave their lives during the war." An application was made to the Royal British Legion for a replacement plaque and finally in its edition of the 18th March 1966, 'The Buxton Advertiser' was able to announce that by public donation a new Memorial would be dedicated on Sunday, 1st May 1966. 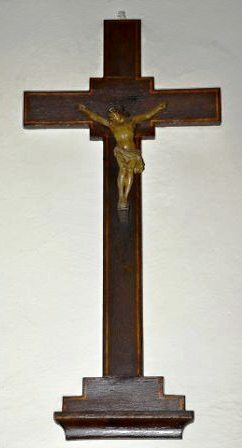 The original crucifix is now in the Lady Chapel in St Mary’s Church, Dale Road, Buxton. J. M. ROBINSON; G. E. SHELDON; C. S. SMITH; A. WILLIAMSON and T. C. WILSON. The Service details for these men can be accessed using the alphabetical names index at the top of the page, or by clicking on the highlighted names in the above list. [N.B. The Second World War casualty named is almost certainly 19 year old Pt. 4977463 John SUTTON, of the 2/5th Battalion, Sherwood Foresters Regiment, killed in action on the 27th May 1940. He is buried in Row B. Grave 1, Oignies Communal Cemetery. Oignies Cemetery contains the burial places of 16 men of the 2/5th Battalion, all killed on the same day as John. Because of the links forged by Buxton Branch of the Royal British Legion with the town of Oignies, the two towns are now twinned. Among those buried at Oignies is Major Thomas Hardy McCALL. He survived the trenches of World War One, serving with the Leeds Rifles from 1915 to 1918 and then joined the Sherwood Foresters Territorial Force in July 1939. By then aged 46, and living in Hathersage, Derbyshire, with his wife, Kathleen Grace, Thomas was a director of a Sheffield steel company and a well respected figure in business circles. A total of 93 men from Bennett Street alone enlisted and served in the Great War. On the new Memorial they are arranged in five columns, with a simple cross in the centre. It is apparent from the alphabetical list that many men from the same families enlisted - six of the Eyre family, four from the Keelings, and three each from the Channings, Critchlows, Ferns, Gregorys, Holmes, Inns and three from the Mycocks. wells, and does Messrs. Berresford Bros., the decorators, great credit. The Mayor (Ald. W.F. Mill, J.P.) observed that this was not the time for speech, but was proud that he had been asked to be present that day. The services of Bennett Street took first honour in the Borough of Buxton (Hear, hear). From that street 39 had served in the fearful war, and ten they mourned today. They must thank God for the blessing of Peace at last. He hoped this would be the end of all wars." 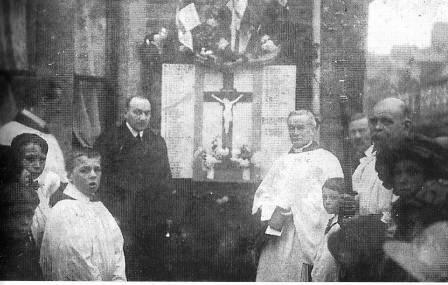 This photo from 'The Buxton Advertiser', dated 16th January 1917, shows the original Memorial being dedicated. In view of the date it can only be assumed that it was erected as a 'street shrine', and names added as more and more of the Street's men joined up or fell in action. 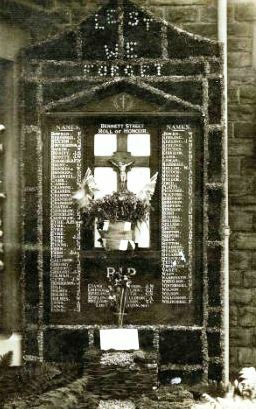 During the First World War there was a popular movement for making wayside shrines, which was distinct from the retrospective parish and civic war memorials erected later. The first street shrine was built in mid 1916 in South Hackney in London and after Queen Mary visited the East End shrines, the idea spread rapidly throughout the country. 'The Buxton Advertiser' also gave details of the new Bennett Street Memorial: "Made of rolled bronze and engraved with the names filled in with enamel, the memorial is expected to stand up to all weathers and be a permanent memorial. It will be mounted on a strong wooden base and hung where the former memorial rested. The memorial has been made by Mr. W Hunstone of Tideswell, and it is hoped that its erection will be marked by a service led by the Rev. 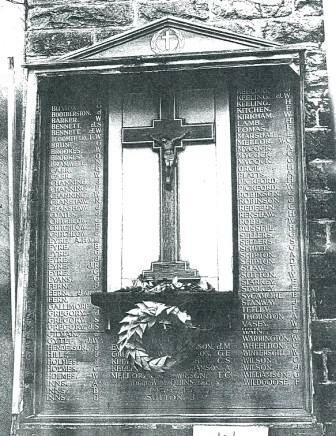 K. Bowler, of St Mary's Church, and that members of of the British Legion, with their standards will also be present. The memorial is costing £136 and together with donations, £116 has so far been raised. There is still £20 needed and the Chairman [Counc. Tom Garton, of Bennett Street] reminds readers that he will still be very pleased to receive donations." 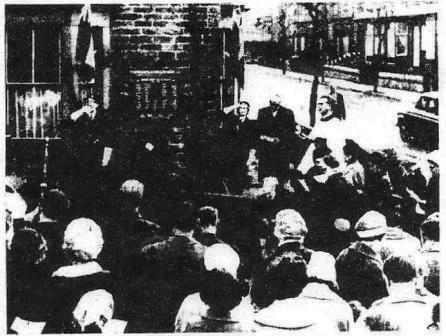 The unveiling date was obviously brought forward as 'The Buxton Advertiser' reported on the 27th April 1966 that it had been dedicated the previous Sunday, the 24th. The [again rather poor!] of the dedication appeared alongside the article. The Rev. K.N. Bowler officiated and thanked "… those who had cared enough to replace the old memorial that through the wear of time and years had been destroyed." He added: "Always keep remembering and always take notice, because it is only when we forget what war costs that another war will happen." 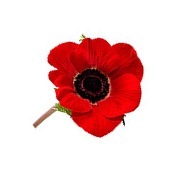 The Last Post was sounded, followed by The Silence, and then Reveille. British Legion Standard bearers and their escorts were in attendance - as can just be seen in the above photograph. It was once again removed for restoration. be fixed to, so once we get the plaque back it shouldn't take long. initiate repairs when the plaque blew off in recent high winds." 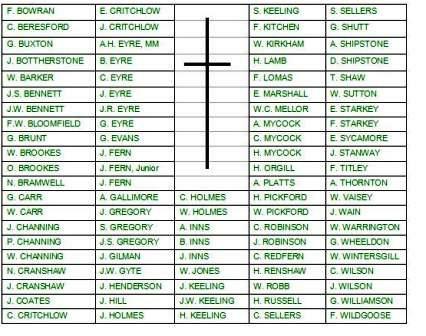 Below the names of those who served are the names of the 11 men from Bennett Street who gave their lives in the Great War, plus the one Second World War death - J. SUTTON.